This explosive DVD peels back Big Pharma’s dark agenda for vaccines and the horrifying medical and spiritual dangers they pose. The fear-marketing and controversy raging over this trillion dollar industry and vaccine use - especially for infants and elderly – is split asunder with Dr. Schnoebelen’s thorough examination of why autism and numerous other childhood ‘mental disorders’ have skyrocketed since the 1950's. 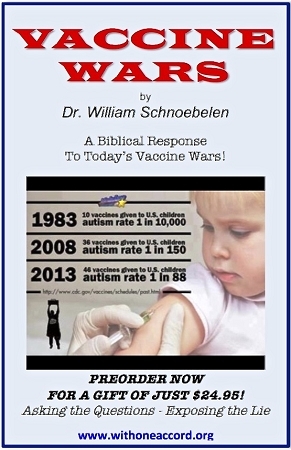 This anointed teaching will open your eyes to the Biblical, prophetic implications of vaccinations and how they are being used as a Trojan, mind-numbing initiation into the Great Beast of Revelation!